November 2009 – ECS was engaged by Branta LLC (“Branta” or the “Company”) as its exclusive placement agent to raise capital for development of its assets in Utah. January 2010 – ECS expanded its role to run a dual-process to potentially sell all or a part of its assets to a strategic partner. December 2009 – June 2010 – ECS and Branta met with a large number of highly capable buyers and capital providers, garnering strong interest from both financial and strategic partners, including Newfield Exploration. August 2010 – Branta sold a 10% interest in its Utah assets to its partner, Harvest Natural Resources, for $20 million and closed on $4 million of equity capital from a private investor group. 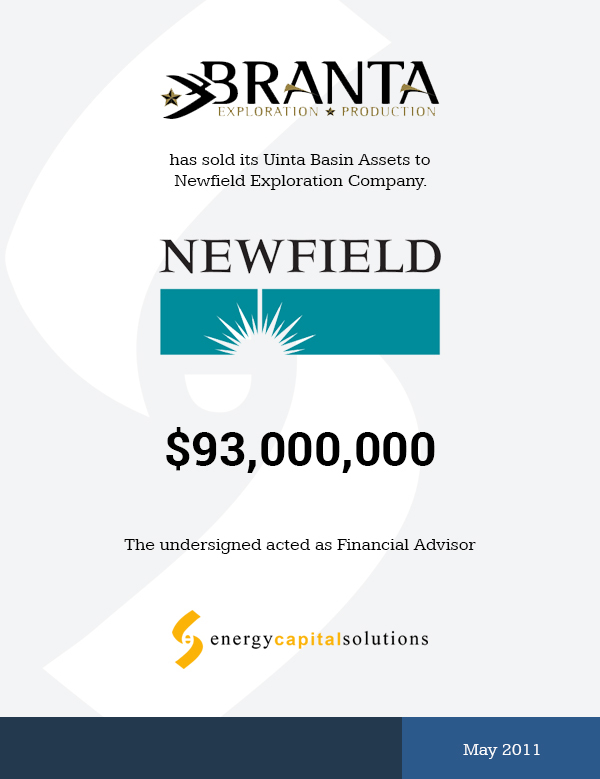 March 2011 – Branta, along with its partner, Harvest, sold its remaining 30% interest in its Utah assets to Newfield Exploration for $93 million. Tailored Dual-Process Marketing Effort – ECS contacted 180 strategic buyers, as well as 62 targeted institutional capital providers / financial buyers. Strong Valuation – Branta received a strong valuation step-up after selling down to Harvest and again after selling to Newfield.